Esperanza came to my ranch in early June of this year. As a half-Friesian and half-Polish Arab, her presence was dazzling; large, excitable, and engaging. Her energy felt big and powerful, but at the same time, nervous. She had lots of questions about her new home and her new herd mates. Esperanza stands 15.2 hands, so in reality, she is not a big horse. Moon, my elder, stands at 16.2. Yet, when the two of them were close by each other, Moon felt dwarfed next to her. Moving Esperanza around took a solid presence and a direct, confident, and focused handler. As a “big girl” who had received very little ground training, she tended to treat humans as she does other horses. Her understanding of personal space and respecting the personal space of others was lacking. I wish I could say I started working with her right away and she got integrated in no time whatsoever. The reality was that all summer I was dealing with an arm injury. I could not lift or move it with ease; even carrying a small whip was out of the question. So, Esperanza worked in programs, grazed in the fields, and slowly was let out with each member of the herd when I deemed it to be a safe situation. I was astonished at how eager she was to learn several of the routines of the ranch. She was always the first to come in, at full gallop, heading right back into the stall she had been in. Then she would turn and look at me with inquisitive eyes. She was more than happy to demonstrate cooperation in hopes of staying on at the ranch. She and Corazon (a wild horse until he was five years old who still acts like a stallion) have still not been let out together. Every day, I watch them very closely to see when and where aggression is displayed by either of them. Recently, I’ve had them eat next to each other along the fence line of their paddocks. Over time, things have changed from Esperanza not daring to go to eat her hay at all, to her sneaking a few bites, to her then kicking out at Corazon and the two of them squealing and quarrelling. Today, they eat peacefully next to each other, while also sneaking bites from each other’s piles, still separated by the metal fence. As of late, I have been putting their new slow feeding bags on the fence and they eat out of the same bag. The ears are no longer pinned and their bodies and muscles are relaxed. Soon, I will place them in a big field together. Through this process, Esperanza has shrunk (energetically-speaking), or at least that is how it has appeared to me. In all actuality, the nervous energy produced in her body and mind caused by her transition into my herd has started to diminish. Her first energy center, located at the base of her spine, is where safety and trust are processed. This area was initially activated and overcharged. When she arrived, she was unsure of who she was and of her place in the herd. Slowly, she shared space with Moon and Diva and established her position with them. She became more confident and settled in her space and understanding of the ways and routine of the ranch. Her first energy center moved from expressing excessive energy based in fear and uncertainty into a more balanced grounded energy as she developed a stronger sense belonging. Of course, she has not changed in physical size at all. It is the energy bubble around her, her energy field, which has changed in the quality of vibration that now gives her a different appearance. We have all seen this expressed in our human-to-human relationships. When a person is afraid, uncomfortable, or unsure of how they belong in a group, they will compensate by either pulling their energy in and getting smaller or by projecting the energy outward into their field, creating a static buzzing. Esperanza did the latter. I will be putting her with Corazon in these next two weeks and I am very conscious about how to do this. Many barns will simply throw the horse in and let them all “sort it out.” I’ve experienced this first hand when I was new to horses and allowed this to happen to Moon. It was not a pretty sight. As Moon had been in a holding facility where he received many bites and bruises, he was depressed, thin, and completely unsure of what was happening to him. He had pulled all of his energy inward as a coping strategy. Out of respect for my mustang, I prefer a more patient step-by-step process to preserve the health and well-being on a physical and emotional level. Corazon has demonstrated his way of being in the world includes beating on new members of the head ruthlessly and not giving in. 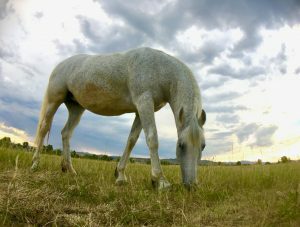 This story demonstrates how important it is for us to remember to see everyone, be it a human or a horse, as their own individual, and that the energetic expression of that individual may change, for better or worse, over time. Our job is to experience the energy of that being, assess what that energy is expressing about the individual’s current state of mind and body, and then support the unfolding of the being’s experience without pushing an agenda or forcing an issue. Who in your life, human or horse, is currently going through tremendous change? What can you perceive is shifting in their energy field during this change? How might they benefit through your non-judgmental observation and sacred space holding of their process? Esperanza is still 15.2 hands high. What has changed is her demeanor. She is softer now, a little bit more aware of her space and others, and she is more present in her body. It will be interesting to see how this all changes once she is put at liberty with Corazon! Be sure to leave your comments below. They are important to me! Kathy, thank you, your writing style is so fabulous. As I read, I felt I was standing right there observing the energy of Esperanza and the herd dynamics as you told them. I love how you’ve taken baby steps to introduce her to the herd members, respecting each individual horse’s space and temperament and going slowly. I look forward to hearing how it goes when she goes out with Corazon and what each of them gets out of it! So fascinating for sure. I really like your three questions posed at the end of the story to ask ourselves and apply this lesson. Thank you for your valuable insight. I am thrilled you received such value in the post. Looking forward to seeing you again soon! Wow, great story, and great timing. Our family is still coping with change following my Mom’s passing almost 2 years ago, and Esperanza is the epitome of the energy that my 21 yr old niece has regarding her positioning within the family unit without her grandmother. Thank you so much for sharing this, it really identified some of my thoughts and how I can honor that space she is in, and continue to just hold space for her as during this transition, as with your arm injury, we are all “injured” from my mothers loss and all struggling with navigating the herd without her. Prayers for you and your herd that all will transition well when Esperanza and Corazon share a pasture, and for continued healing of your arm! You are very kind. I hope that your transition went well and that your niece also was able to move through her pieces. Horses are such great teachers for us. Good reminders. They say time heals all wounds, however, it does not always feel that way when you are in the thick of it. Lovely read Kathy! Inspiring to be conscious to better feel the needs behind the energetic change in my loved ones (horse & human). Wow – beautiful sharing Kathy. As the executive director of a horse rescue, with a large herd, I understand your sensitivity to the introduction of horses to one another, We have experienced some challenging introductions of new horses through the years, always a learning curve it seems. There are many dynamics at work within a herd from the leaders to the hierarchy of each horse member to the individual personalities – all to be considered. It can certainly be tricky so I appreciate your sense of timing and preparation for Corazon and Esperanza. I think we that work with horses and humans within the EFLC realm know of the importance of holding space and slowing down, being patient. But we also forget and get busy. Thank you for this highly important timely reminder of holding space in a neutral way (if possible) for horses and humans. I enjoy your story as it inspires me in my work with horses as well as humans. I am a psychologist working with kids and youngsters, and the same seems to be very appropriate with them. Many times people have tried to force certain ways onto them, and they respond by either pulling in their energy or expanding nervous and often self staging energy and behavior. This is a good story to remind me, that I need to try and give them room, space and nonjudgemental response to slowly see their energy shift. I am curious as to ‘your base of spine’. Area. Would it be loins or further back under the gluteals. I ask as my new horse of two years was a rescue and underconfident. He showed his stresses to a huge degree by the gluteal muscles raising. To sometimes a really deep channel between. This has lessened a lot over this short time. But still sometimes comes. Privacy: I value your trust. I will never share your information with anyone, for any reason. See the complete calendar of upcoming programs and locations. Visit our calendar page here for a complete listing of upcoming events for the Equine Facilitated workshops, as well as formal training program opportunities. Locations include the beautiful home ranch in Colorado as well as other equine-related destination and resort locations. Escalating Emotions – Who is the Leader? 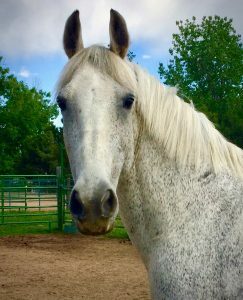 For the last 10 years Kathy has traveled internationally teaching tools for body-centered awareness, personal leadership and Equine-based Learning programs. She has reached countries such as Australia, The Netherlands, Belgium, Finland, Denmark, Singapore, Canada, Latvia, France, Saudi Arabia, New Zealand, South Africa and Spain just to name a few. Click this link for more information on Kathy Pike and her experience with horses. Many of the photos on this website were taken by Louise Campbell. All photos on this website are protected by copyright and cannot be used for any purpose without express written permission from Kathy Pike.